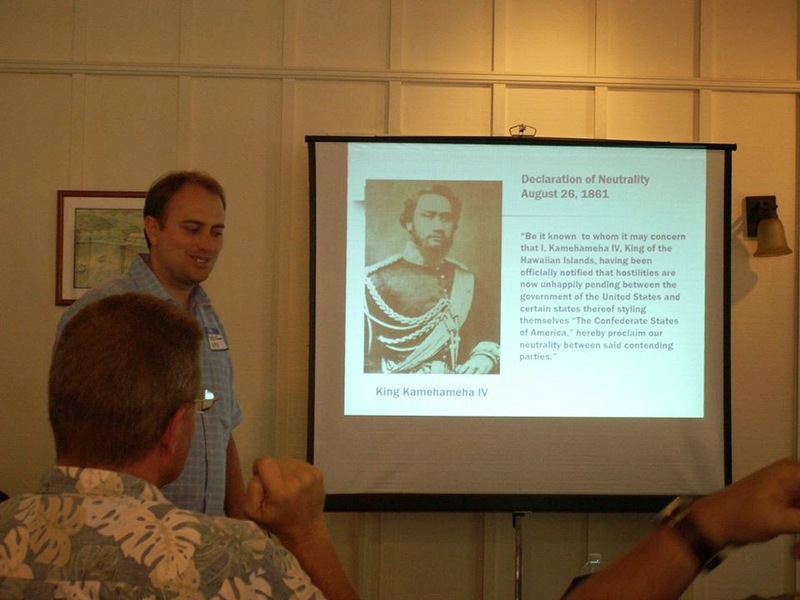 Dr. Justin Vance Ed.D, Associate Professor of History at Hawaii Pacific University, delivered a presentation on the history of Native Hawaiians in the American Civil War at our History Education Hawaii Summer 2014 conference in Honolulu. Dr. Vance mentioned that the Hawaiian Kingdom proclaimed neutrality. John Wood Bush was one Native Hawaiian who served in the Civil War. He was the only one who received a pension after the war. J.R. Kealoha was a member of the 41st Colored Infantry Pennsylvania 1864-1865. Most Hawaiians were not registered under their Hawaiian names. Timothy "Honolulu" Henry Pitman is the next Native Hawaiian Dr. Vance presented. He was only 17 when he enlisted in the 22nd Massachusetts, serving in the Battle of Antietam, etc. He was the only Hawaiian who was a POW and died as one. He is buried in Mt. Auburn Cemetery in Massachusetts just short of his 18th birthday. Not able to attend this session? Here is Dr. Vance delivering remarks on the USS Missouri in 2012. History Education Hawaii, Inc., also has a playlist on You Tube dedicated to this important part of Hawaii's history. Click here.